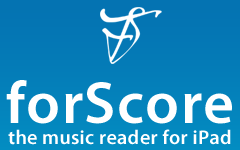 If you are not aware of what ForScore is and if you are a musician I am surprised! Unless of course you have never thought about using your iPad to read your from. This is the very reason I first wanted an iPad so badly. I wanted all that music I usually carry around with me and have had to keep track of every year while teaching, to be in my iPad. ForScore is one of those apps I use to make this dream a reality. Whether you are teaching music with your iPad, a performer using your iPad in concert instead of paper music or just someone who enjoys playing your instrument, you should have PDF music on your iPad! It’s the best! Better handling of non-standard and landscape oriented pages. Many of these new updates are not things that would make you say “Oh, look at THAT!” when you open the app after updating. All of the updates are going to make your life easier though while using ForScore. The Pink arrow is pointing to a search tool to help you find music FAST. The yellow arrow is pointing to the new method of inputting metadata. The orange arrow is pointing to the toolbox that you used to have to dig into to edit metadata in the past. Jump down below this screenshot and I will explain further. And finally for one of the new features. The PDF files you load into ForScore obviously all have a title associated with them, this should come as no surprise. Each PDF can also have other metadata associated with each file as well to help you in organizing and finding each song that you want. I have hardly ever used this metadata in the past for two reasons. First it was too hidden and was buried in the toolbox icon. Ok, Ok, I here what you are saying… HIDDEN? Two taps was all it took! I know but that’s my opinion. Now this excuse is gone because in each title there is now a drop down menu right in my face to input this metadata (check out the yellow arrow above.) That gives me this screen…. In OSX if you create a PDF file you are given the option to input Title, Author, Subject and Keywords. These are all the same sort of metadata but ForScore has renamed them to what you see in the screenshot above. This drop down menu also is where you will connect a song from iTunes to a PDF allowing you to play back a song while you follow along in ForScore. 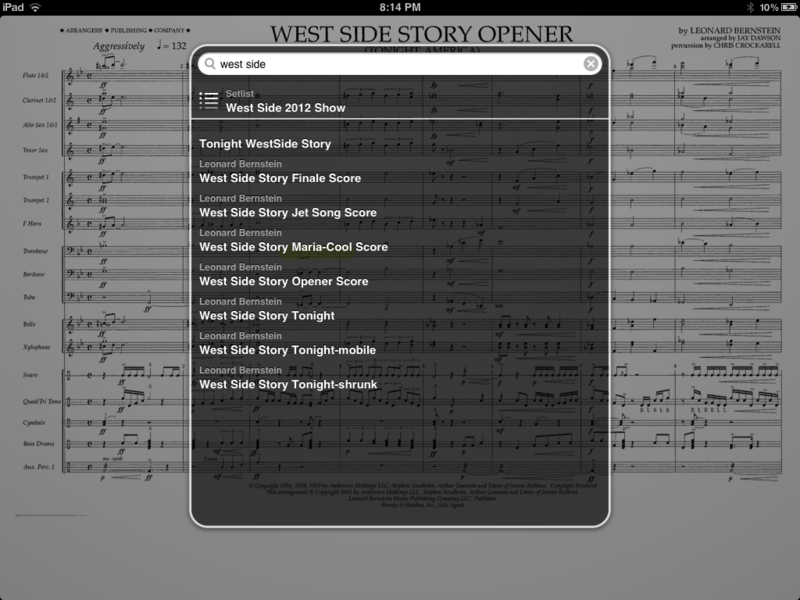 Saves you from having to hop out of ForScore app into the iTunes app. The song can play while you turn pages. If you happen to turn the page to a different piece that song would stop playing. I could never for some reason remember where to make association in the ForScore App. Now it will be much easier to remember. One other reason I have not used this metadata in the past much is that ForScore doesn’t actually change the original PDF file to insert this metadata permanently. There is a great post about this and how to make sure you backup ForScore so your hard work entering this metadata does not get lost. Head over to the Technology for the Classical Singer Blog and read about it. No since in my describing this process when it is done so well at that post. You really should add that post to your RSS reader feeds by the way! I am looking forward to the sharing features. UnRealBook from Aron Nelson has had features for sharing setlists and files now for some time. 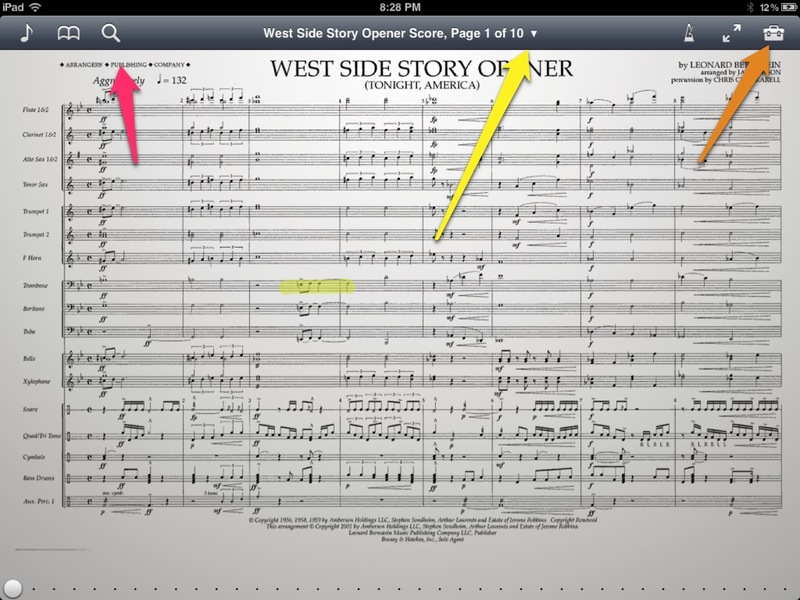 This feature is very useful if you are in that sort of situation where others are using their iPad to read music. UnRealBook does have the feature as well where you can use two iPads for your music. In other words you will have two pages of music spread over two iPads! The two iPads work in sync with each other and the pages turn appropriately. What fun huh? oops…. sorry this post if about ForScore. The page turns seem faster too. OK… well as I only now have 1.5 weeks until I go to Band Camp, no jokes about “this one time…”, I will be discovering more new features that I appreciate and will keep you posted. As always… leave comments below about what you discover – Share the Joy! Now, my wife has made me a big bowl of popcorn, real popcorn too not that microwave stuff! So I must go find some movie to watch….. Hmmmm…. the new Thousand Foot Kructch live DVD or the Yanni Live concert from YouTube or maybe I should watch the Presonus webcasts series or maybe a real DVD Movie. decisions decisions….. Thanks for the shout-out! This is also quite a helpful post. 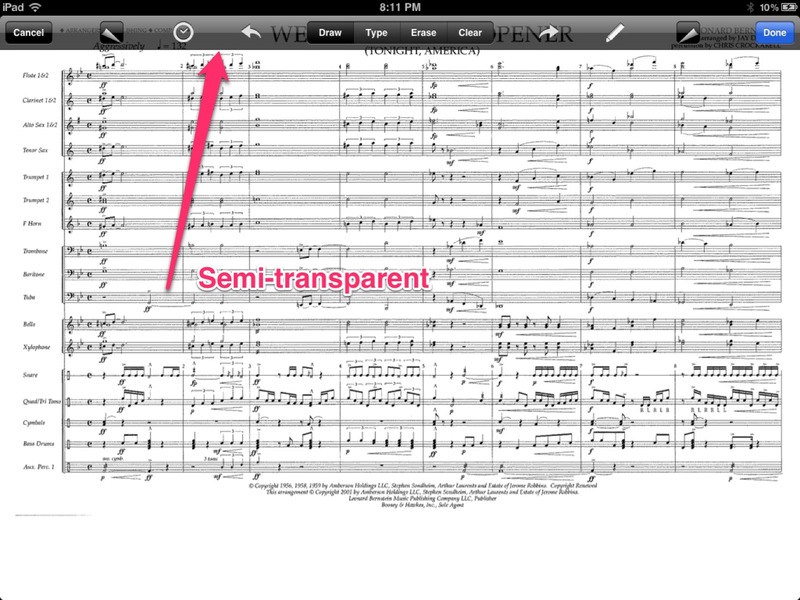 The screenshots caught my attention & I’m surprised at how legible a full band score is in landscape mode. Also, the double-iPad feature in UnRealBook is something I didn’t know about and it sounds really cool – although I don’t think I’ll be affording multiple iPads anytime soon! I enjoy watching how you are using tech and what you write. 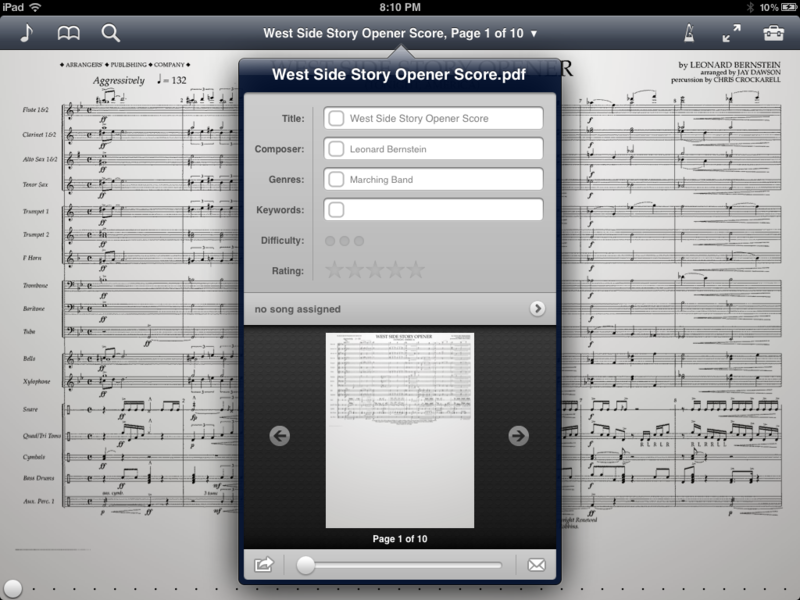 I don’t use the iPad if I am working with intense concert band scores, at least not until I am very familiar with them. I usually also have a PDF loaded up with each individual part as well. Or I will input the music into Sibelius and use scorch. I look forward to watching your blog…. Keep writing. I am a teacher with a shiny new iPad. I’ve been following your blog every since I came across it while writing a research paper for a Master’s class. The paper was mainly about Apple devices, but I touched other things as well. I am in a wheelchair and paralyzed from the chest down, so my iPhone has been a real lifesaver! I had a question about this post. forScore really appealed to me because it is a hassle for me to sort through 10 or more scores. Is this app feasible to use on a daily basis for rehearsal? Is it even possible to see the score well enough on the screen? Pep band for basketball games is a big deal at my school and trying to organize 30+ scores is a pain (I currently have most of them in a HUGE binder that ways a ton). Would this app work for something more laid back like that? I would think that switching back and forth to the many codas and del segos could be bothersome. Any advice you could give would be, by me, greatly appreciated.